There’s precious little question that the Instant Pot Ultra 6 Qt 10-in-1 Multi- Use Programmable Pressure Cooker is the best Instant Pot model on Amazon. The problem is it’s also quite expensive, and it typically doesn’t go on sale very often. Today is one of those rare occasions when Amazon has managed to slash the price though, and you can snag an Instant Pot Ultra for $109.99 instead of $150. Trust us, this thing is going to change your life. 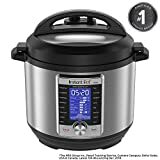 Instant Pot Ultra electric pressure cooker is the next generation in kitchen Appliances. A central dial with a simple turn and press provides added precision in program selection and adjustment. New features: altitude adjustment, cooking indicator, and a steam release reset button. The Ultra button provides custom programming. The new features include sterilize, cake and egg programs. Replaces 10 common kitchen Appliances – pressure cooker, slow cooker, rice/porridge cooker, yogurt maker, cake maker, egg cooker, saute/searing, steamer, warmer, and sterilizer. Developed with the latest 3rd generation technology with an embedded microprocessor. The microprocessor monitors the pressure and temperature, keeps time, and adjusts heating intensity and duration. UL certified with 11 safety features to provide peace of mind. New steam release reset button for safer handling. All components in contact with food are food grade 304 (18/8) Stainless Steel.